The fusion of multiple genres of music embodied in one individual, EchoSlim is a DJ / Producer who lives for creating new sounds and performing those creations live. Growing up listening to House, Reggae, R&B, Hip-Hop, Funk, and Alternative amongst many other genres, EchoSlim's main objective is to expose listeners to new forms of music while giving them something that they are already familiar with. Musical enlightenment. This was one of the most difficult projects I have ever taken on, but it has by far been one of the most rewarding songs I have ever completed. This particular riddim (instrumental for my non Reggae heads), wouldn't have been created without My Brother and Producer / Engineer extraordinaire, Nicko Rebel. Mr. Rebel emailed me a concept of this Riddim on the first day of 2013. In fact, I have an actual sample of this concept below. Besides the concept sounding really dope, I loved the name of the riddim being that I have a great respect for Rastafarian culture. Nicko is a sick producer, and I know he didn't need my help to work on this riddim, so it was an honor for me to collab with him on this project. My approach to expanding on this already cool idea, was to try and take it as far left as possible without offending anyones ears when they hear it. I put some work in on this track sporadically while on tour with Black Violin. Then I linked up with Nicko between local tour dates in Miami, and we completed a good basic concept. However, it wasn't until My Brother and world traveled drummer Mr. BEATdown!, came down to Miami and laid down some sick live drums, that we realized we had a potential monster on our hands. Take a listen to that rendition below. Maybe it was the vibe at Urban Elite Studios, where Legends like Sly and Robbie often record, because BEATdown! did his thing in one take. So once we got this version of the riddim, we immediately started thinking major. Which artist can we get? Everyone who heard the riddim said it didn't sound like traditional Reggae, so the suggestions started coming in. "Why don't you get Lil' Wayne, or Kanye West, or Rihanna?" Myself and Nicko were just honored that our peers would suggest artists of that stature. We are both Reggae heads, so we wanted to target a major artist in the Reggae industry. One particular artist stood out that was on fire around that time, and he just happened to be a friend of mine. I reached out to that artist, and he actually loved the Riddim. All that was left to do was to wait till we both got off tour and link up in person to finish the track. During this time, I was actually in Australia on tour, and Nicko emailed me a crazy update. He some how got the Great Mr. Dean Fraser and Mr. Ronald "Nambo" Robinson to put down a horn section on this track. Nicko sent me the horns and I immediately arranged them out of sheer excitement in my hotel room. Listen to this track taken to yet another level. So now that we got some living Legends to bless the riddim, we were waiting for my bredren to get off tour to knock the vocals out. After numerous attempts to try and link up with him, we just couldn't get our schedules to match. He eventually went on to become one of the top Reggae artists recognized globally at the time and still is today, so I couldn't even be mad at him. I was proud just to say he's my friend. This situation unfortunately, left me and Nicko stuck with this sick riddim that we didn't want to just give to anyone. We knew its potential, and it needed someone major that would accompany it. Fast forward a year later after listening to the riddim thousands of times, my publicist at the time, Olimatta Taal, had this cool idea to do a compilation project to help raise money for a cure for the Ebola virus which was rapidly spreading throughout North West Africa. I thought it was a great idea at the time and donated this riddim and my time to help produce the entire project with her. After she reached out to many artists for their help, the super talented Ms. Nadine Sutherland was one of the few artists to contribute her talents to this project. 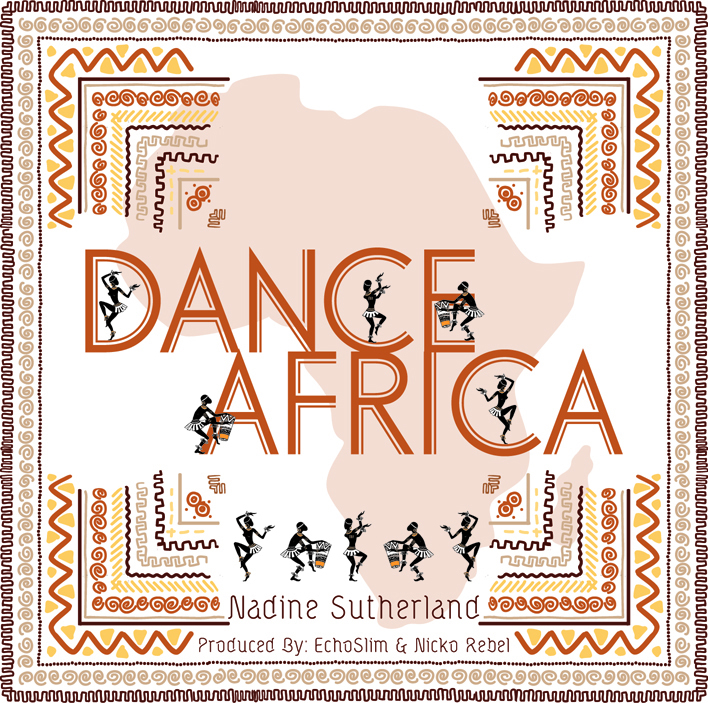 She wrote such a beautiful song with genuine love and affection for the Continent titled "Dance Africa". Once I got the vocals for this song, I instantly got chills. Ms. Sutherland's voice sounded so pristine. As a sound bwoy growing up, I loved playing Nadine Sutherland's records. It was such a nostalgic feeling to know that an artist I revered so much liked my production enough to record a song to it. I arranged her vocals in Jamaica, and sent them to Nicko to mix. He mixed this song to near perfection. Nicko normally mixes most of my music, and I must say this was one of his best mixes ever. Listen for yourself. So even though we were not able to get enough artists to complete a compilation album, thankfully the Ebola virus had become contained worldwide. The cases of infections significantly decreased. Once we got the song mastered, we had to put it out. We waited long enough. Nicko linked me with the Great King I-Vier of Independent Distribution Collective. They distributed the song with my label, Musically Unifying Records on iTunes a few weeks ago, and it is already doing great things. Even the Legendary Mr. David Rodigan like the song enough to play it on his radio show. This project taught me many life lessons. It taught me to never be sold on one idea and always keep my mind open. You may not get what you initially want, but in the end, you will get what you need and possibly something even greater. It also taught me to never rule out the impossible. I never even dreamed that I would get Reggae Legends that I highly revere like Nadine Sutherland, Dean Fraser and Nambo Robinson to be apart of this initial 6 second idea. To get another Legend like Rodigan to cosign this record was also unexpected. Not many artists can get access to these great people on any project let alone on the same song. I give thanks for that every time. Most importantly, this song taught me to never give up regardless of your circumstances or feelings. Positive thoughts breeds positive movements, thus making this World a more positive place to live. Checkout NickoRebelMusic.com for more details on the actual mixing process of this song by the Great Nicko Rebel.